Building a simple rain garden is a great way to add interest to your yard while soaking up and cleaning stormwater. This guide will get you started. Visit the resource tab to download the rain garden fact sheet and to view additional resources. Pick a site that can capture water from your roof, driveway or the street. If catching runoff from your roof you can direct the downspout directly into the garden or allow the water to flow over your yard and into the garden. Avoid low locations with standing water as these areas will not allow the rainwater to easily soak into the ground. Plant the garden at least 10 feet from your foundation, especially if you have a basement. Avoid slopes and areas where bedrock is close to the surface. Plan for overflow from the garden in the case of very heavy storms. Make sure that overflow will not flow toward your foundation. A good rain garden will allow the rainwater to soak into the ground; this is called infiltration. To determine if you need to add additional soil to your garden to assist with infiltration, you will test the soil to determine how quickly it can soak up water. Dig a 6-8 inch deep hole at the location you chose for your rain garden. Fill the hole with water. Time how long it takes for the water to soak into the ground. If it takes less than 6 hours for the water to soak in then your location is perfect for a rain garden. If it takes between 6-24 hours you will need to add additional soil. If it takes more than 24 hours you should pick a different site for the rain garden. Most storms in Massachusetts contribute 1 inch or less of rain water. If the rain garden is sized to hold the first inch of water that flows off impermeable surfaces into the garden, it will be able to handle most of the stormwater from most storms. If the rain garden will collect rainwater from half of your roof, follow the steps below to estimate the recommended size for the garden. Measure the length and width of your house in feet. Multiply the length by the width. This will be the approximate size of your roof in square feet. Divide this number by 15. This will be the approximate size of your rain garden in square feet. For detailed information on how to calculate the rain garden size see the video at right or the information on the UConn Rain Garden website. The Franklin Rain Garden Project has worked with Lyon Landscape Nursery Inc. to design several complete rain garden kits for you to choose from. Here are some things to consider when choosing plants for your rain garden. Determine whether your garden is in the sun or shade. Consider which season the plants will bloom and how they will look together in the garden. Keep in mind each plant's mature size and plan for future growth. 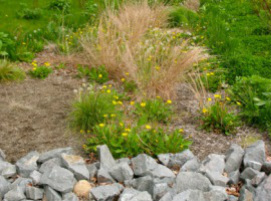 Remember: a rain garden best supports plants that can tolerate both wet and drought conditions. Find additional information about plant selection and a complete plant database on the UConn website. Avoid buried utility lines. Call before you dig! Mark out the area where you will build your garden. Remove 9-12 inches of soil from the area that will become your rain garden. If directing stormwater into your garden via a pipe, position the pipe in the garden. Position stones around the opening to help slow the water and avoid erosion as it enters the garden. Be careful not to block the opening of the pipe. Lay out the plants in the garden. Try to prevent tall plants from blocking shorter plants. Dig holes for each plant. Each hole should be as deep and twice as wide as the plant's root structure. Place the plants in each hole and cover with the growing medium. 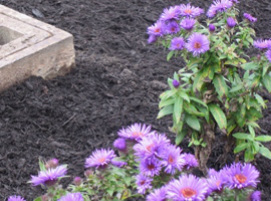 Add mulch to your entire rain garden avoiding the base of each plant. Water your plants with water. The plants will need 1 inch of water per week for the first 1-2 months until they are established. When it does not rain, water the plants with 1 inch of water per week. Pull up any weeds or invasive species from the garden. Check the areas where water enters and leaves the garden for erosion. Fix any problems and add additional stones if necessary. 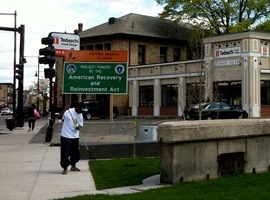 Pull up weeds or invasive species. Add a thin layer of mulch annually. Remove any dead branches or vegetation. Prune shrubs or trees if desired. Check the areas where water enters and leaves the garden for erosion. Fix any problems. Check the garden for excess sediment and remove as necessary.